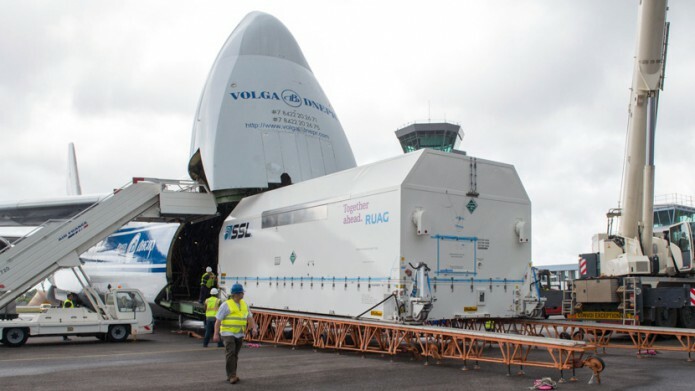 The protective shipping container with EchoStar XVIII is unloaded from a chartered An-124 jetliner at Félix Eboué Airport, which was followed by the satellite’s transfer by road to the Spaceport. The first of two Space Systems Loral-built satellites to be orbited on Arianespace’s next Ariane 5 mission has arrived at the Spaceport, initiating the payload preparation phase for this heavy-lift flight in June. EchoStar XVIII was delivered to French Guiana yesterday, arriving at Félix Eboué Airport near Cayenne aboard a chartered Antonov An-124 cargo jetliner. After unloading, the spacecraft was transferred by road to the Spaceport, where it was moved into the S5 payload processing facility for the start of pre-flight checkout. EchoStar XVIII, built for DISH Network L.L.C., is a Direct Broadcast Satellite (DBS) designed to provide exceptional sparing flexibility for the DISH fleet. The satellite will be used by DISH to augment its existing fleet and to assure the highest level of ongoing service to DISH customers. EchoStar XVIII is based on the 1300 satellite bus produced by Space Systems Loral (SSL). SSL is a leading provider of geostationary commercial satellites, and this Palo Alto, California-based company also built BRIsat – the second passenger for Arianespace’s Ariane 5 mission in June. BRIsat will serve Indonesia’s PT. Bank Rakyat Indonesia (Persero) Tbk. – also known as BRI – with the spacecraft to operate as a dedicated relay platform for banking connection services across the Indonesian archipelago. The Ariane 5 mission with BRIsat and EchoStar XVIII is designated Flight VA230 in Arianespace’s launcher family numbering system, and is one of up to 12 missions planned during 2016 with the company’s launcher family composed of Ariane 5, along with the medium-lift Soyuz and lightweight Vega.